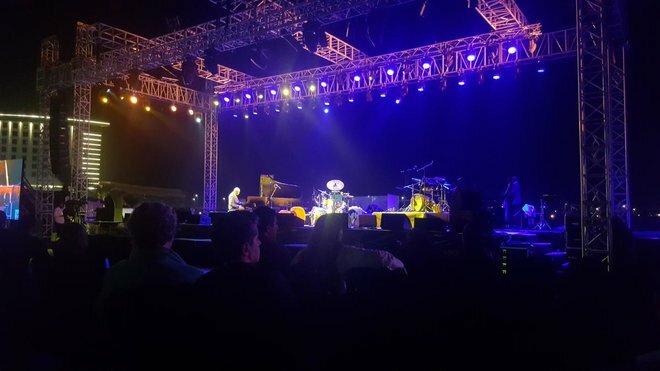 (Arab News )- JEDDAH: World-renowned and Grammy-winning musicians took to the stage on March 22 as the largest jazz festival yet held in Saudi Arabia got underway. The location for the two-day event, featuring 10 acts, was Juman Park in King Abdullah Economic City (KAEC), which echoed to the sound of soulful and rhythmic tunes deep into the night. One of the largest privately run economic projects in the world, KAEC is a residential and business location in Northern Jeddah. It has quickly established itself as a leading venue for concerts organized by the General Entertainment Authority (GEA), a government organization set up to develop and expand entertainment in Saudi Arabia through high-quality events. Thursday night’s jazz lineup included one local and four globally renowned artists. First up was Min Alriyadh, a Saudi band who blend contemporary and Arabic music styles. The international names on the day-one bill were Charbel Rouhana, a prominent Lebanese musician known for his distinctive oud-playing style; alto saxophonist Kenny Garrett, formerly of the Duke Ellington Orchestra and Miles Davis Band; four-time Grammy Award-winning jazz pianist McCoy Tyner, and world-renowned French jazz trumpeter Erik Truffaz, known for mixing elements of hip-hop and rock. The gates opened around sunset, providing the ideal lighting and atmosphere to kick off the evening’s festivities. As audience members made their way to the seating, they had a wide variety of food carts to choose from. The day-two line-up features The Bright Side, a Jeddah-based covers band who play a wide variety of jazz and easy-listening classics; Grammy-winning guitarist Al Di Meola, a staple of the jazz world for more than 40 years; Trio Joubran, three oud-playing Palestinian brothers who perform traditional Arabic music with a jazzy twist; Canadian guitarist and Juno Award-winner Jesse Cook; and Grammy-nominated American singer and guitarist Raul Midon. The roots of jazz date back to the 19th Century in New Orleans, with a style that combines African-American rhythms with European-American instrumental heritage. It is often characterized by bluesy notes and erratic chord-based improvizations. With each generation of musicians contributing their own personal interpretation, the musical style and composition of jazz is constantly in a state of evolution — and appropriately true to its unpredictable nature, it now finds itself with a fresh audience in a new country, amid the deserts of Saudi Arabia.